Copyright, 1893, by Chas. K. Harris. Words and Music by Chas. K. Harris. Arranged by Jos. Clauder. Why turn away from me, darling, why are those tears on thy cheek? Let me look into your eyes, love, I'll patient be-won't you speak? What have I done thus to grieve thee, have I caused one moment's pain? All that I ask is a reason, I'll silent be till you explain. Still in my heart I adore you, let us be friends again. Is then your answer the same, love, must we be but strangers now? Do you believe them, my darling, think you I'm false to my love? If strangers dare come between us, if they can tear us apart. 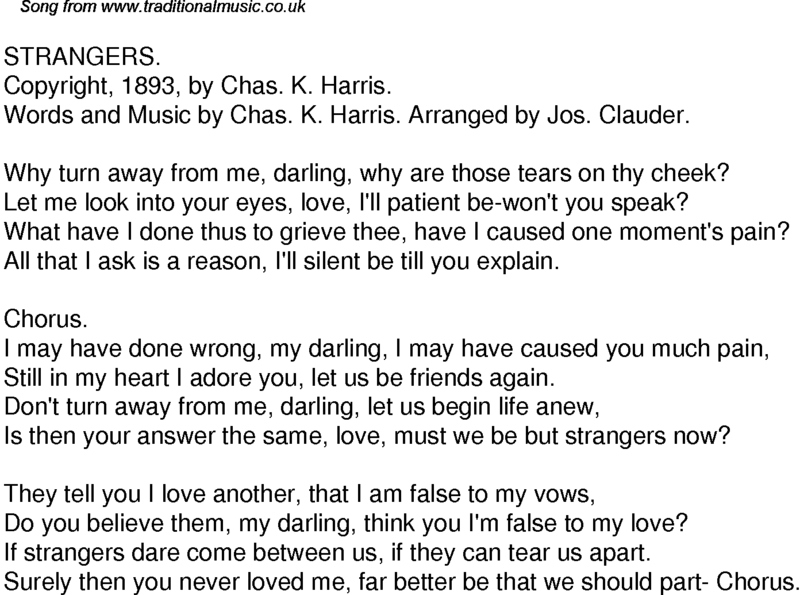 Surely then you never loved me, far better be that we should part- Chorus.